The live export industry's claims of a city/country divide are as dubious as its animal welfare 'standards'. When shocking footage across five separate live sheep export shipments was released to the media back in April, it rocked the nation. Yet the live export industry has regularly attempted to both play down the concerns of rural Australians — and dismiss the response of those living in cities. Independent polling commissioned by the RSPCA has shown that, in reality, Australians in all areas are incredibly concerned about sheep export cruelty and wish to see it end. The poll even found that at almost 95%, more people in rural and country towns than anywhere else are concerned over the inadequacy of current standards in the live sheep trade. 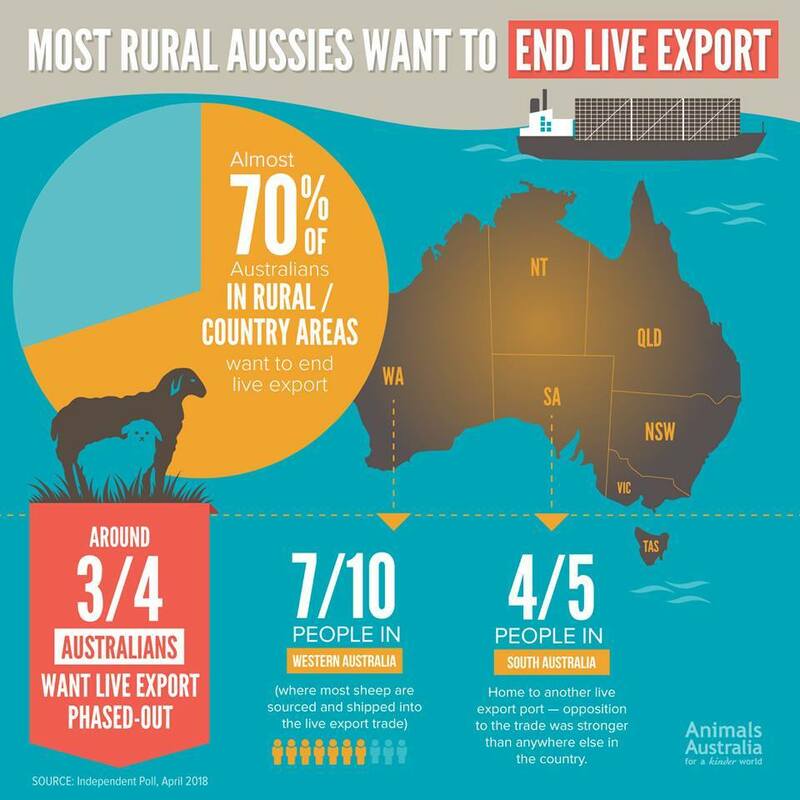 In addition, almost 7 out of 10 Australians in rural areas said they want to end live exports — in line with national figures showing that around 3/4 of Australians want to see the trade phased out. In Western Australia (where most sheep are sourced and shipped into the live export trade), there was no change in support — with again almost 7 in 10 people opposing live sheep export. And in South Australia — home to another live export port — opposition to the trade was stronger than anywhere else in the country. Four in five South Australians noted their opposition to the cruel industry. Since footage of shocking sheep export cruelty first aired, farmers and other people living in rural Australia have spoken out online in condemnation. Many concerned farmers have stated that they no longer wish to support the live trade and are exploring alternatives. A Bill to phase out live sheep exports is due to be debated by politicians shortly, and every single email, phone call and meeting with MPs is now critical in deciding the future of the trade. Click here to send an important message to your MP, asking that they support an end to live sheep export cruelty. This new ad could change the way politicians think about live export. Labor commits to ENDING live sheep export! Call & thank them now!